Five cylinder engines get no love these days. Long considered an oddball configuration with neither the power of a six nor the fuel economy of a four, the straight-five was only ever really embraced by a handful of carmakers. They're becoming even rarer these days as companies look to shrink their cylinder count for fuel economy reasons and shove turbochargers on everything. But there's one five-banger I won't soon forget. You won't find them under the hood of any new Acuras or Hondas. Even Volvo, who for decades carried the torch like a British Royal Marine, is reportedly phasing them out in favor of three- and four-cylinder engines. If V8s and V6s are on the way out, what chance does the I5 have? So maybe the five-cylinder is headed for extinction like the dinosaurs. 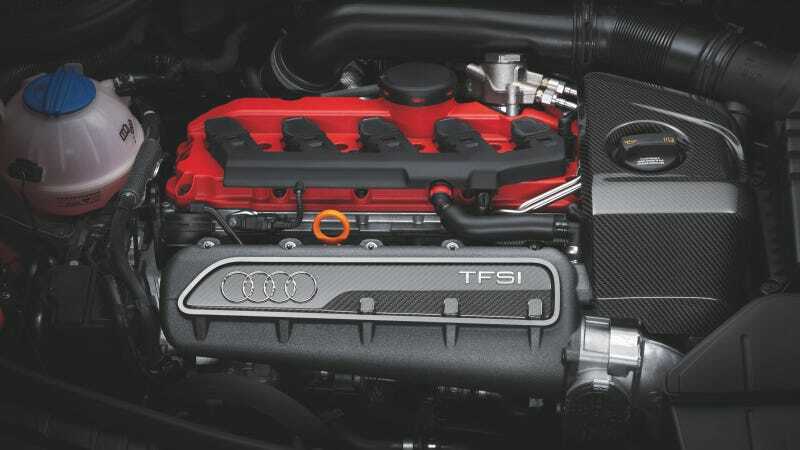 But even the dinosaurs had a T-Rex, and the engine that's at the top of the five-cylinder food chain has to be this: the snarling, turbocharged Audi 2.5 TFSI, which sees duty in both the Audi TT RS and RS3. With 360 horsepower and 343 lb-ft of torque in the U.S. TT RS, it is a truly fitting salute to Audi's rallying engines of yore, which were also 2.5-liter five-cylinders. You may know that VAG makes a 2.5-liter five cylinder for the Jetta and base Golf. That engine is widely considered to be a noisy, underpowered, inefficient dud, and is set to be dropped (see what I'm talking about?) in favor of a smaller turbo four. But thanks to some heavy re-working by the mad scientists at Quattro GmbH, this turd gets polished into a weapon of mass destruction. Audi helps us break down why it's so great, starting with the cylinder block. Because of its short overall length, it works well in transverse applications. The block itself is made of high tensile vermicular-graphite cast iron, which means it is both light in weight and able to withstand incredible stress. The cylinder head is similar to the 2.5-liter VW engine, but here it has been thoroughly modified to provide more durability. Changes include a different aluminum casting alloy, sodium-filled exhaust valves for better cooling and a new intake port. Other additions include direct injection, a new engine management system, an intercooler and a K16 Borg-Warner turbo good for up to 17.4 psi. With these goodies, the 2.5 TFSI prdouced 360 horsepower at 5,500 rpm and 343 lb-ft of torque between 1,650 and 5,400 rpm in TT RS form — enough to shoot that car from 0 to 60 mph in a mere 4.1 seconds. In the RS3 Sportback (which really should be sold in America, Audi) the engine has 340 horsepower and 331 lb-ft of torque; that hatch will do 0 to 60 in 4.6 seconds. Pretty incredible for a car that only displaces two-and-a-half liters. So what do people have to say about it? Our ownMike Spinelli drove the TT RS last year and "It's quite an apparatus... at a tick past 1,600 rpm the car launches like Hidalgo charging for the Najd horizon." MotorTrend said "the TT RS' acceleration is ferocious." If you're still not convinced of its potency, this video gives you a good sense of its aural qualities Listen to that. LISTEN TO THAT! It sounds like a gattling gun that fires hornets instead of bullets. So maybe five-cylinders are on the way out. Let's hope not. But if they are, they couldn't have asked for a better swan song. Note: This is a new feature I'm trying out called "Great Engines," where we profile engines that are, you know, great. Got any suggestions? Drop 'em below in Kinja.